Hello there! So today I thought I'd blog about boothing (is that a word? Well it is now!) at a convention! When TourNewSoul first started going to conventions in 2011, I must have tried looking up about a million how-to and help blog about boothing at an Artist Alley. Of course, I honestly couldn't find more than one or two, but I read them over and over again to try to calm myself down. Getting like fifty $100.00 counterfeit bills ($20.00's were a worry too, but I was convinced $100.00's were gonna get me!) though to be honest, even one counterfeit was terrifying to me. People were going to approach the booth and just start YELLING. FOR NO REASON. People were going to approach the booth and point out every detail of every hat and why it was wrong and should never be sold. Someone was going to shoplift the hats. We weren't going to have enough change and people were going to get MAD about it. We were going to run out of inventory. Or we were not going to make a single sale. Our booth was going to fall over. My weird smile was going to scare people away. None of those things have actually happened though, so that's the good part. Though we did once had the hat house collapse on us while we were building it, which was not funny then, but it's kind of funny now. #1: people don't know they are carrying money that isn't real, so make sure you break it to them nicely. #2: more than likely, it's probably not a fake bill. But it's always good to check, and you can read over some easy ways of telling here (it was the first search result on google). Or you can always purchase a detector pen. It should be noted: In my six years of handling money in large sales, I have not run across a fake bill that I know of. So there's my two cents! Second on the list are customers. Now there are a few things you need to always keep in mind about customers. #1: They are pretty much always friendly, especially if you are also really open and friendly yourself. Your customers are the most important part of the business, and it is SO ABSOLUTELY IMPORTANT (don't know how stress this more) that you seem welcoming and open. Being friendly and kind is how we run TourNewSoul, and that's how we've made new friends and many, many sales! Without a happy smile, people are less willing to come over and check out your stuff. After all, your art may be beautiful, but it stands strong with the creator. So be really nice. #2: If you do encounter someone who may not be friendly, or may seemingly be out to just be rude, roll with it, and be nice anyway! There have been a few sales I've made just by being patient and kind. Sometimes people don't realize they aren't being as friendly as they think, or they may be having a bad day. But regardless, as the face of your brand, you smile, smile, smile! And in case of that one person who really does mean the rude stuff they say: Just thank them for their interest and they'll move along on their own. People can be rude. That's life, sometimes it happens. But you don't let it get in the way of your sales. You would never want another customer to think you treat anyone with anything but the upmost kindness. That's how you make a great impression! Long story short, shoplifting can happen, but if you are always keeping a watchful eye over your goods and a consistent list of your available and sold inventory, you're pretty much in the clear. It's never happened to us, thankfully. And I believe it's just all about awareness. Make sure you booth with another person, that way your goods are never not being watched and you're free to leave your booth anytime you want to go to the bathroom, eat, peruse other booths, whatever. First and foremost, YOU SIGN UP TO GET A SQUARE READER BEFORE YOU GO TO A CONVENTION. DO IT. NOW! ..Or any other type of card reader (Paypal is another good one!). About three-quarters of our sales are through credit cards, so don't be the artist who loses a bulk of their sales because they didn't think ahead. Square is easy to sign up with, and free for the reader. They charge a small percentage in fees, but about the same as paypal or any other service. So do it! It'll be great for your business. On the subject of change, I always make sure to bring at least $200.00 in small bills: $20s, $10s, $5s, and $1s. You'll need to adjust depending on your priced items. For example: if you have items priced at $17.00, you'll need a lot of $1s because you'll most likely be giving out $3.00 in change each time you make a sale on those items. A small note I've noticed: people generally pay in $20s or $5s. With that in mind, price your items keeping in mind how much change you want to be handing back out. If you don't want to worry as much about change, I suggest pricing items in sequences of 5's or 0's. For example: Price items at whole numbers like $25.00 or $30.00. That way, you are generally giving out change in $5s and not a ton of $1s! But that's just a little suggestion. #1. Bring as much merchandise as you'd like to sell, reasonably. Keeping in mind that when you are almost out of items, your sales will dip considerably. A customer doesn't want what's at the bottom of the bin, they want the best items on top. If you have very little stock to sell (because you sold it, or because you didn't bring enough) you are very likely not to sell as well as you could. Plan to bring as much as you can afford to. #2. You will make a sale. I promise, you will make a sale. Don't worry, people go to conventions in part to buy what you are making! If your sales are lower than what you'd like though, take your chance at meeting customers face-to-face and ask them what they'd like to see more of, and what you could do to meet their needs. Businesses call that market research, and best of all, it's free since you're already there! #3. Pricing is important, and your personal choice.There are a lot of formulas for establishing price, such as materials + (time x hourly rate) = price, or this is an in-depth read on pricing art. Keep in mind, if you see a similar type and quality of items that you sell being sold at a certain price, that is usually a good indicator as to whether you're in the right zone. Go too low and people wonder what's wrong with your art. Go too high, and people may feel they don't want to invest in a single item when they could buy multiple small things. It's a push and pull (that's economics for you!). Oh boy, this is a hot topic. Everyone has their own way of building their booth. Some prefer metal storage cubes like these (remember to get the connectors to keep the sides all together!) or a metal or PVC pipe frame to hold up their photos. It's all up to you and what you're trying to sell! For TourNewSoul, we try to come up with displays that draw people in. Something that makes customers interested in our products from far away. In the past, it was a wood fame house that we built. We've also constructed a PVC tent. But something to note is that convention lighting is awful, and if you do make something with a roof, bring some lights. Remember that each convention has different guidelines on what height is allowed for displays. For some, it's 7' from the ground, others it's 8'. Make sure you check before you make any final decisions on your first display. We've constructed our display to fit a 6' table 2.5' deep with a height from the ground at 7'. That way, even if the tables are on the high side, or a little thin, we can still fit! And most of all, make sure it's secure. Don't try to construct your display at the convention for the first time. Make sure you know how to do it, and what you need to keep it safe and secure. Otherwise you could have your booth taken down, or worse, hurt someone! It's worth it to do a trial run ahead of time. As we near the end of this blog, I want to make sure you know one thing: You got this! 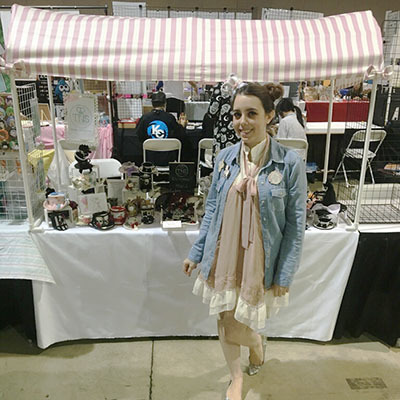 If you've read this post, it means you have a basic idea of what you need to think about before hand, and what to look out for when you're at the convention. The only other things you need are your smile (even if it is a little silly!) and your product. Take pride in your work and get excited, there is no thrill like boothing at a convention! You get the chance to meet people who genuinely love what you make, and as an artist, I personally find nothing more humbling as that. Enjoy your time, have fun, and smile. You're going to do great! Here are just a couple other notes I didn't mention above that may be of use to you! Bring plenty of water. You'll be talking a lot! Bring advil or some type of headache medicine. Type out an inventory list of everything you have and keep track of your sales and stock. Offer commissions if you are able to. Sometimes people love your art but can't find what they want. Don't turn away a sale if you can help it! Bring bags or some type of protection for your artwork. People don't want to damage it once they pay for it in a busy convention hall. Make sure you have a TON of cards. Everyone who passes by takes one. Or better yet, hold on to your cards behind the table and give one to anyone who asks or a customer! That way those who are most interested have your information. Encourage people to follow your social media to keep in touch. Bring supplies like tape, scissors and whatever you may need in case of an art emergency. Bring a table cloth. They are likely not provided. Display a sign with your brand name so people know who you are! Bring a phone charger and an extra portable battery! You don't want to lose credit card sales because your phone died! Have your seller's permit with the correct location on it. If you have any questions or comments, feel free to comment below or message me under the contact tab at the top! I'm happy to answer any other questions you may have. Good luck, and have fun at your convention in the Artist Alley!